Guests spend approximately 3 hours with 2 hours paddling. 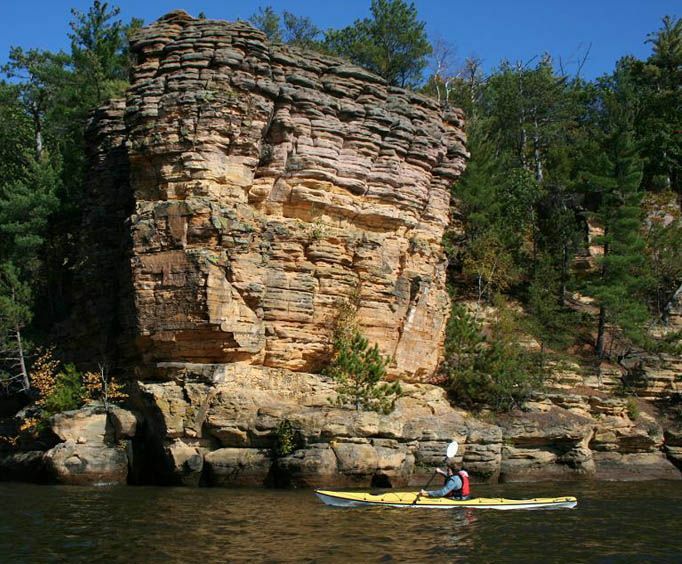 Guided kayak tour on the Perupper Dells includes towering rock formations, Native American pictographs, overhanging rock ledges, and miles of sandy beaches. For exciting water adventures in the heart of the Wisconsin Dells, be sure to embark on a kayak or paddleboarding Adventure Tour. With a variety of tour options available to guests, there is something perfect for any age or skill level. Your expert guide will tailor your tour to you. Families may enjoy gazing at sandbars and beaches, while the more adventurous explorer will get an intimate look at the hidden coves within the Dell's rock formations. Regardless of which tour you take, you're sure to have an enjoyable time as you spend three hours relaxing on the calm and beautiful waters. Each tour is led by a professional guide who specializes in making sure you get the most out of your Wisconsin Dells adventure. 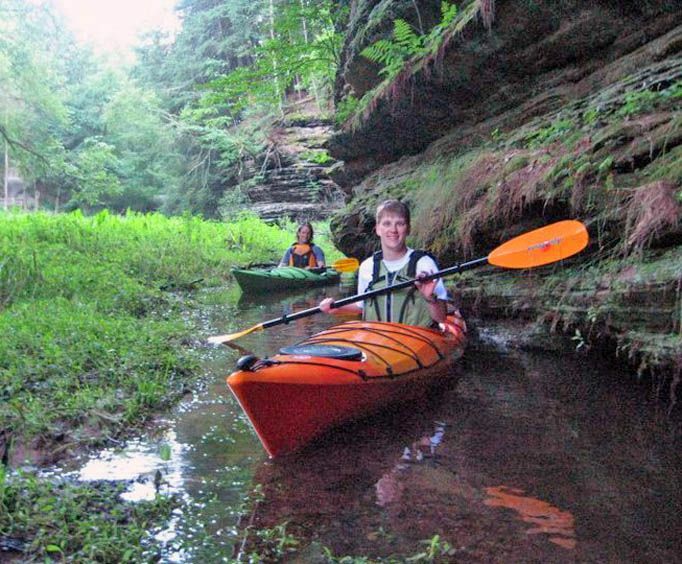 With tandem and single kayaks available, the Adventure Tours in the Wisconsin Dells make a great option for families looking for some fun in the sun, couples looking for some relaxation, or a solo adventure in nature. While now the Dells are typically thought of as a hot new vacation spot, there is a rich history that made the community what it is today. It’s properly named, “Wisconsin” being the Native American word for dark rushing waters and “Dells” being French for layers of flat rock. Even in 1856, as the city was just beginning, it was already thought that the unique yet romantic scenery of the area would keep it a getaway spot for years to come. Referred to as the Waterpark Capital of the World, the Wisconsin Dells live up to that. With the beautiful nature surrounding the area, the Dells are a perfect destination for anyone looking to soak up some views. In fact, much of the area is now part of a State Natural Area or a State Park, showing just how much the community values their beautiful land, waters, and unique rock formations. 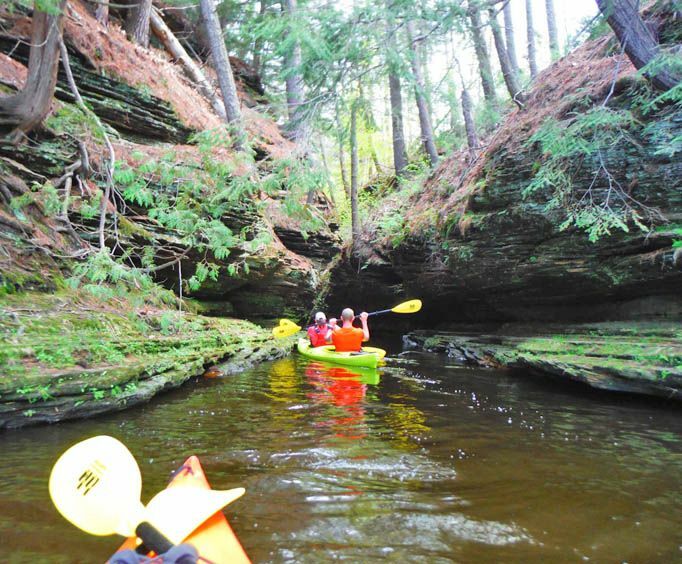 For an up-close look at the beautiful scenery that surrounds the Wisconsin Dells, be sure your vacation includes a kayak or paddleboard Adventure Tour. Departing straight from Vertical Illusions, guests will be guided through the calm and relaxing waters of the upper Dells. As you paddle across the water, guests will get to enjoy views of some of the largest towering rock formations within the Dells, miles and miles of sandy beaches, and even some native American pictographs along the way. This tour is great for beginners or a simple and relaxing journey with a kayak. Starting at Chimney Rock Park, guests who embark on the paddleboard tour will get to enjoy warm sandy beaches and the beautiful clear waters of Friendship Lake. Your guide will walk you through all of the main points of paddleboarding until you feel like a pro, all while you’re enjoying the great outdoors.